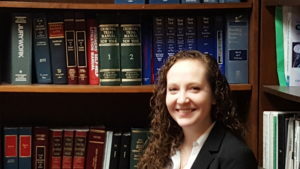 Shannon McGlew is a new Staff Attorney in our Civil Program. She is currently handling Unemployment Insurance cases. She attended school at Saint Bonaventure University graduating in 2014, and Syracuse University College of Law, graduating in May 2017. She was admitted to the New York State Bar in January 2018. She chose to work at HLAS because of our focus on helping the community and underserved populations. She also feels that there are many different learning opportunities here which are ideal for a new attorney.